Murray Whelan is political advisor to Angelo Agnelli who has just been reshuffled out of the Department of Ethnic Affairs to the portfolios of Water and the Arts. Whelan knows next to nothing about both and fears the worst. Agnelli though sends him off as the advance party in the Department for the Arts and straight to a function with party politico and committee stalwart, Lloyd Eastlake, a financial wheeler-dealer and self-made man. Whelan has his eye on Salina Fleet, another Arts committee member, but the night ends on a sour note, not with Fleet in his bed, but fishing her dead financee, struggling artist Marcus Taylor, out of the moat in front of the National Gallery accompanied by a suicide note bemoaning how the state has treated him. Twelve hours after being handed the reins to his new department Whelan’s boss is faced with a front page story. Whelan has a nose for political trouble and intrigue and pretty soon he’s putting it where it’s not wanted, just as his son arrives in Melbourne from Sydney for a weekend break. Trying to juggle spending quality time with his son and investigating Taylor’s death, Whelan pings from one calamitous event to the next. 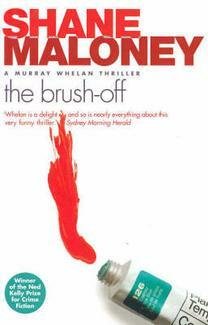 The Brush-Off is well plotted and paced comic-crime caper, with some very good set pieces and nice observational touches about politics, the art world, family relations and the city of Melbourne. Maloney writes in an easy, engaging and witty style and he clearly knows the political world which he satirizes. Murray Whelan is a great creation and totally believable as a kind of hapless schemer and general feck-up who manages to scrape by with a mix of charm, bluster and luck. Indeed, the characterisation and the interaction between characters is first rate, each well-penned, with credible dialogue. 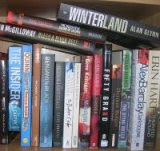 The book won the Ned Kelly Prize for Crime Fiction in Australia in 1996. It’s not hard to understand why. I thought it was a great read and I’m looking forward to reading the next book in the series, Nice Try.